Perform a small test for me. Close your eyes, and spend 15 seconds considering the state of the laptop market and what devices interest you, are available, or on the horizon. Done? Let me hazard a guess – Apple’s offerings loomed large over $800, with $1500+ gaming laptops on the periphery. At $300 we’re more in tablet-first space with a mix of cheap clamshell rubbish. In the middle is an assortment of $400-$700 good but not always great mixture of 2-in-1s (like the Surface) or clamshells (like the ASUS UX305), divided mostly on price and features but 95% of them contain Intel. 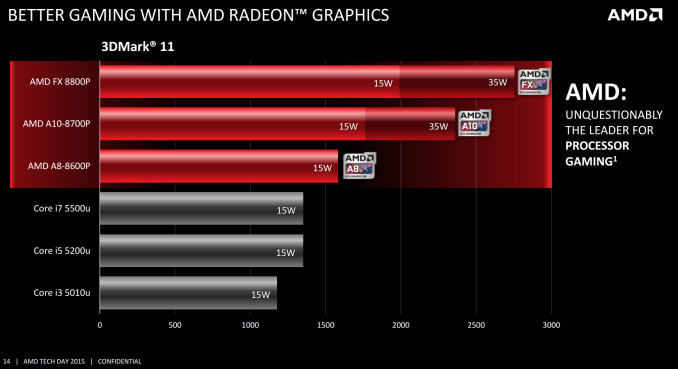 Today’s launch of Carrizo by AMD is hoping to change that perception, particularly in $400-$700 and at 15W. Previously when we have mentioned Carrizo, such as when AMD opened the lid on a few important aspects earlier this year, all thoughts pointed towards the new core under the hood, Excavator, and if there would be any desktop presence to speak of. As we recently discussed in the latest desktop APU release from AMD, Excavator is purely a laptop play, and today’s release of Carrizo explains a lot about why that is the case. As with any major processor release, the usual remits ring out in the marketing: better performance, lower power, ‘we want to be the best’ and so on. 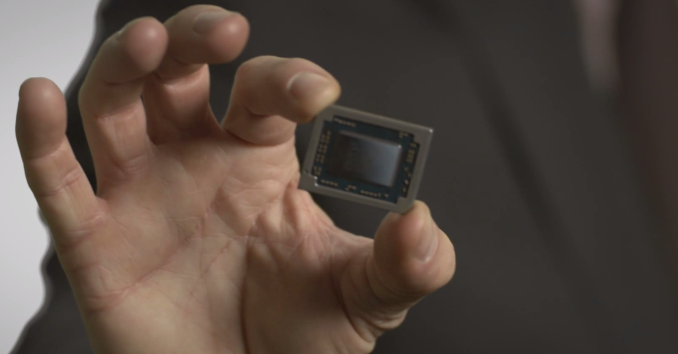 A large part of AMD’s product launches require understanding of why they release what they do. 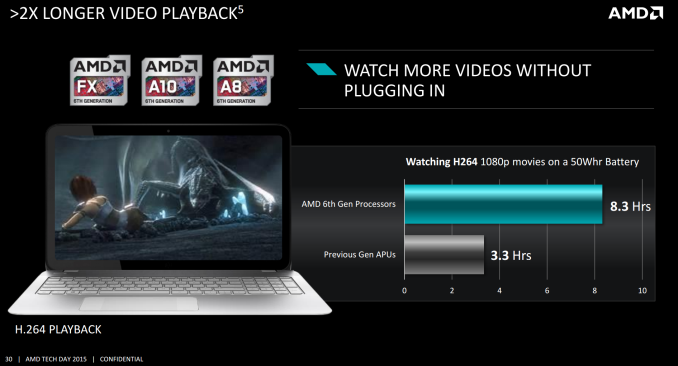 But as I mentioned at the top of the page, AMD’s problem in the laptop space is a result of their competitor taking most of the market, particularly in halo products, big name contracts (Apple) and what you actually see on the shelves. 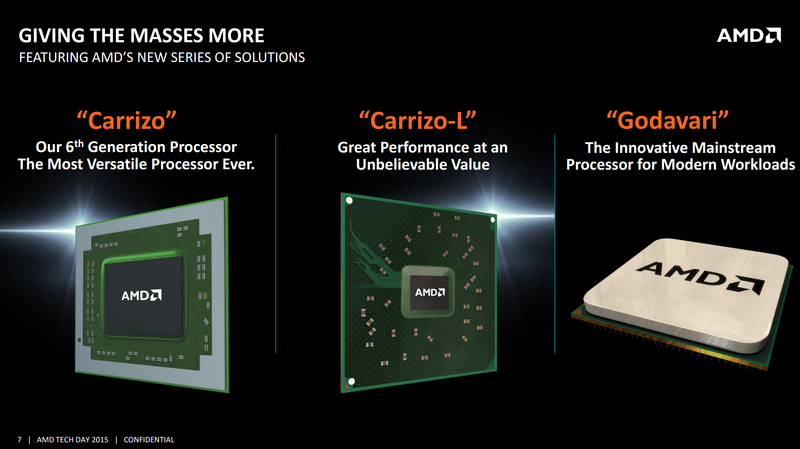 AMD’s purpose with the launch of Carrizo, as one would expect, is to change that around. 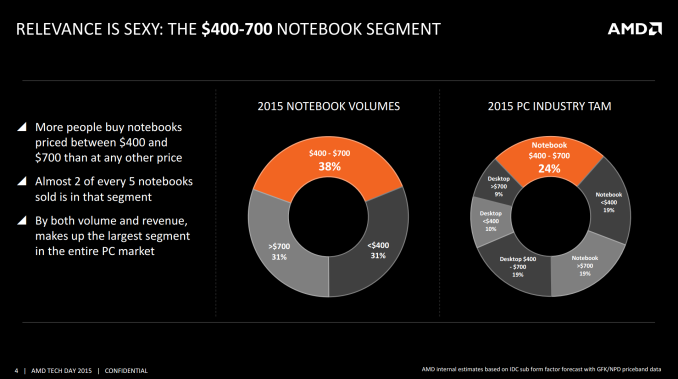 AMD’s argument is that the notebook/laptop segment accounts for 52% of the revenue in the consumer computing space excluding tablets, with the biggest market of that being $400-$700. As a result, Carrizo was built to be poised to bring competition to this market, and potentially provide premium level performance and a more palatable price range. That being said, in my own opinion, the slide provided by AMD is rather telling. 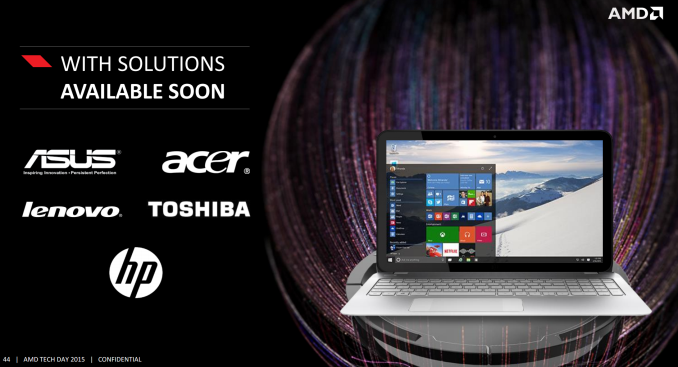 The PC industry is severely fragmented and there is no one single product segment that stands out than others. 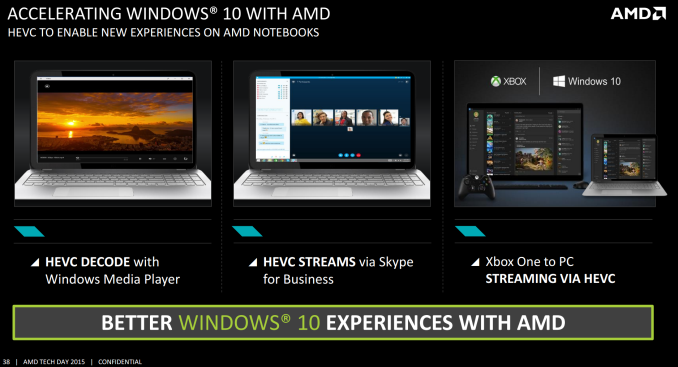 Even within notebooks, the actual market ranges listed above are about equal, comparing 4-in-10 for the middle segment against 3-in-10 for the others a piece. To borrow analogy from MediaTek, the ‘Super-Mid’ category where 80% of sales are in the mid-range price for smartphones just doesn’t exist in notebooks. It also means it comes across as quite difficult to produce a single product that scales across that large range, and we end up with extremely focused product launches like Carrizo today. That’s not necessarily a bad thing, as it means the users in that segment end up with that focused, optimized unit. Carrizo is one of three AMD releases this year, with one being the recent launch of Kaveri Refresh desktop APUs (codenamed ‘Godaveri), and the other is Carrizo-L. Carrizo-L is not launched yet, but we know that it is designed to be a counterpart to Carrizo in similar power segments but using AMD’s latest ‘Cat’ core designs which offer a cheaper alternative but are designed to be almost plug-and-play with Carrizo as they both have the same socket. We will have more information on Carrizo-L later in the year. 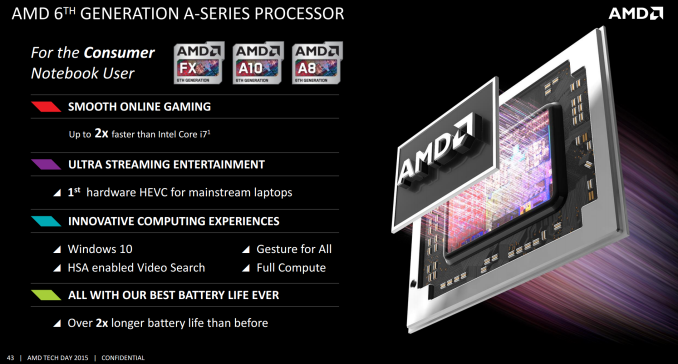 Carrizo’s goals are simple, and should apply to A8, A10 and FX (yes, mobile FX) processors. The big things here are the price, keeping in the $400 to $700 as the mainstay, and the ‘all day unplugged’ performance. Notice the asterisk there, and the small text stating ‘all day defined as >8 hrs idle battery life’. I’m sure a few of our readers snickered at that a little bit, as did I the first time I read it, but let’s be serious for a moment – this is the position AMD is coming from, and perhaps it is a little concerning that the world’s second largest consumer x86 processor manufacturer can’t get an elbow into the laptop space due to how quickly the user experience method of evaluating things, such as how long a charge lasts, compared to the iterative cycle of processor updates. That speaks volumes regarding strategy and targeting, both of which have been key points in discussing AMD so far this decade. But this slide indicates that AMD is pursuing the path that indicating what bare minimum requirements should be. An issue with that is down to the OEMs though – a good processor in a bad design is a bad product after all. Rather than write about markets and concepts for this entire article, I want to go through some of the architecture changes AMD has bought with Carrizo, but first we come to high level performance. We should note that the numbers here are all solely provided by AMD, as we have not had a chance to test the systems ourselves yet. 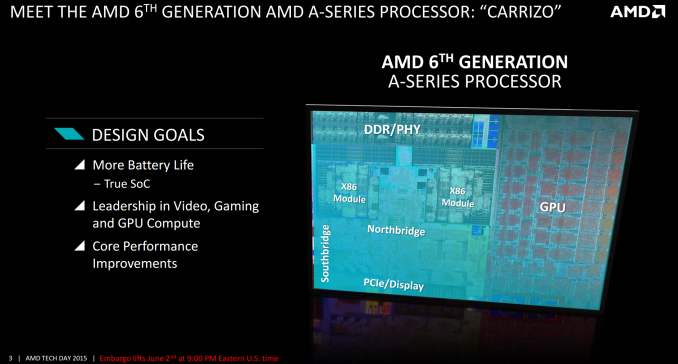 We have some exciting plans in the works to cover the performance in depth in due course, so stay tuned for that, but first the above slide indicates some of what AMD hopes to provide with Carrizo. Carrizo will be a 15W focused part, with the A10 and FX models having an additional 35W mode although this will be at the discretion of the OEM. This makes life a little difficult, as the name of the processor is no-longer the clarification of performance and I’d hazard a guess and say that OEMs will not put ‘15W’ or ‘35W’ in front of their naming regimes. Nevertheless, AMD’s provided results comparing their 15W APUs to some of Intel's 15W CPUs, and in those results the 15W APUs compare favorably. The Intel parts are HD 5500 graphics, with 24 execution units (the i3 has 23). It is worth noting that Intel also offers 15W SKUs with the higher-frequency 24EU HD 6000, so the HD 5500 AMD is comparing themselves against is not Intel's most powerful iGPU. That said (and in all fairness to AMD) this isn't AMD's doing but rather the OEMs'; since none of the OEMs have shipped any 15W HD 6000-equipped products, AMD has not been able to look at HD 6000's performance. Similarly, Intel offers a 28W Iris 6100 range of processors, but these too are not in products that AMD could test. I would imagine that the team that wins when those come out would be first to publish benchmark results. 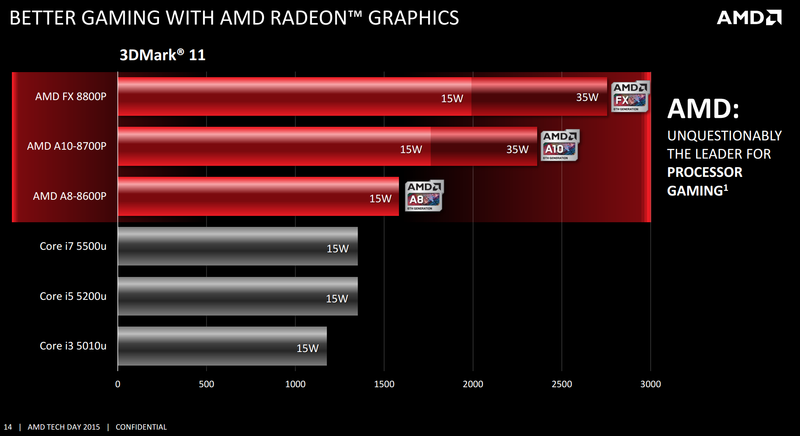 But overall the 15W target is AMD’s main focus here. At AMD’s Tech Day a couple of weeks ago, they did have a few Carrizo laptops on display. There were fairly non-descript clamshells made by an OEM but with the latest spin of the APU inside. All but one of the units were running on integrated graphics, but the other also held the R7 M365 GPU which could be used in dual graphics mode with the 8000-series APU to give the R7 M370DX (D for dual). Unfortunately we weren’t allowed to perform hands on testing at the time, and the slide above doesn’t match up the percentage increase for DIRT, but Starcraft’s numbers at least show a bump over 30 FPS when moving into dual graphics mode. Dual graphics will become more important when DX12 comes along, as Carrizo will support Asymmetric Rendering, allowing each GPU in the system to be a render target depending on the strength of the GPU, rather than the cobbled together Crossfire way we do things now. One of Carrizo’s strengths lies in the video decoder and the path for which video takes through the SoC. By minimizing data transfers, increasing the bandwidth for the unified video decoder and the onboard HEVC decode IP that makes it the only x86 SoC with a full HEVC code pipeline, battery life is increased substantially, according to AMD. We go into more detail on the next pages when discussing the architecture updates, but AMD is stating that their improvements to the whole video pipeline from loading into memory and playback will aid both battery life and the experience. 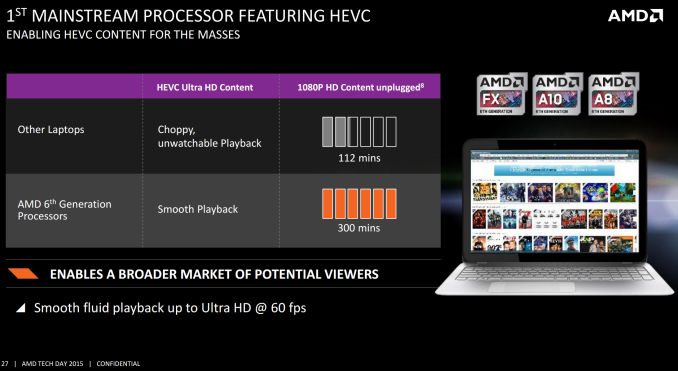 For 10Mbps 1080p HEVC content, AMD is stating 300 minutes of unplugged playback time on Carrizo compared to 112 minutes with Kaveri. It is worth stating that the systems used a 13x7 eDP panel using PowerDVD14, with the system power of the 15W TDP Carrizo-based system at 10.02 W (12.6% CPU utilization), giving 299.4 minutes on a 50 Wh battery, using DDR3-1600 memory. The Kaveri system, also 15W TDP based using DDR3-2133, used 32% CPU utilization averaging 26.72W for 112 minutes on the same battery. That’s a big step, and I would be interested to see if the memory made a difference there. HEVC still is not the normal way of delivery video yet as H264 still remains king. AMD performed the same test using the same equipment above using the H264 clip of Big Buck Bunny to arrive at 8.3 hours playback for Carrizo against 3.3 hours with Kaveri. This is down to a number of things, but the UVD now has 4x the bandwidth, allowing 1080p frames to be decoded in 1/4 of the time, forcing a race to sleep. Carrizo is designed to have full HSA 1.0 compliance, assuming the standard doesn’t change between now and users getting devices into their hands. As with the 'HSA ready' Kaveri APUs, the weight of potential with OpenCL to use the heterogeneous system architecture is something that AMD needs to exploit in order to promote more positive experiences. Needless to say, AMD has been doing this. 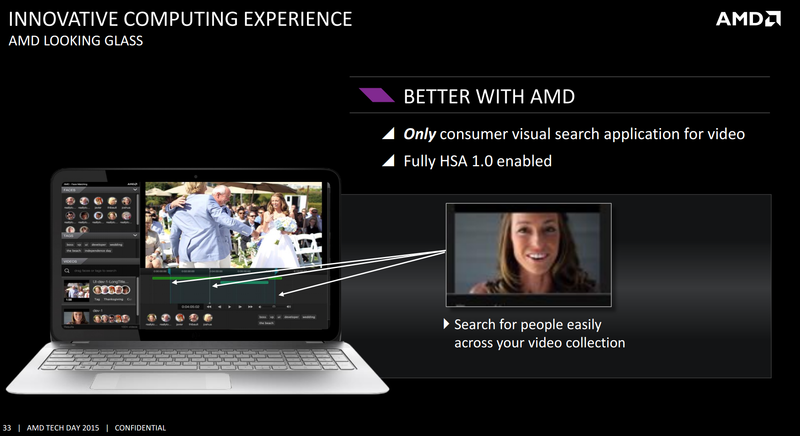 One feature AMD presented is a new piece of software called Looking Glass. This uses HSA enabled through OpenCL to essentially perform video tagging for faces. It will recognize common people in your videos, and tell you where in those videos those people are. One example of this is to keep track of home videos, most of which usually end up un-named, and allows users to have a quick reference to what videos John or Jill are in, then collates them to be used in other programs such as video editing. This has archival potential as well, and although personally I am not much of a video taker I do see the merits in such a system and can understand that processing through video frames, running facial recognition algorithms on each is both a compute and memory intensive process that something such as HSA can aid. Windows 10 acceleration is also in AMD’s plans, particularly revolving around the HEVC decode pathway in the APU. Anything that involves video playback or streaming is ripe for this, although I would imagine the major players having both feet in this concrete well before it sets down to the mainstream. 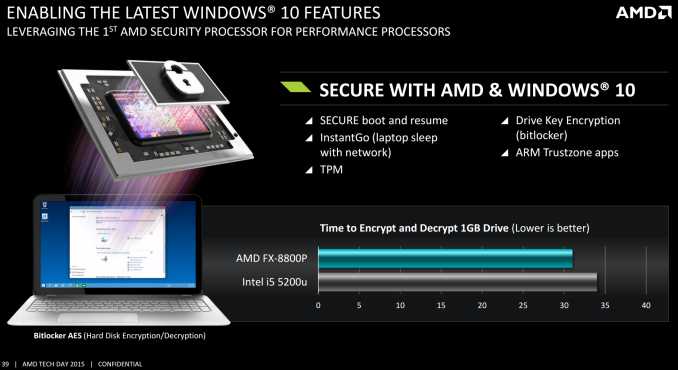 Carrizo also comes with security though a built in Cortex-A5 processor into the die. This divides out memory and processing to allow a complete secure ARM TrustZone element separate from the main CPU cores and memory. 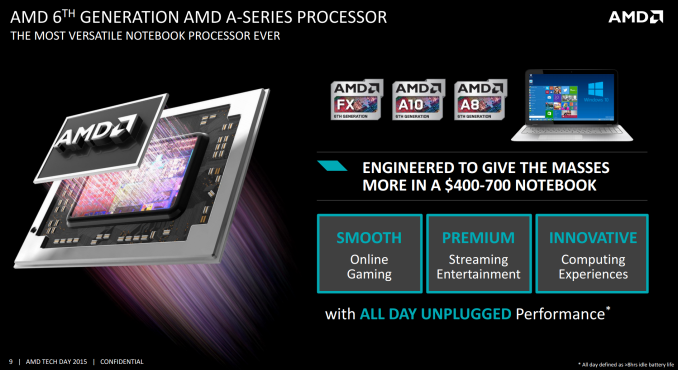 AMD’s focus on this, quite understandably, is business. At the other end of the spectrum, for consumers, AMD is bundling codes for Batman 3 or DIRT Rally with their APUs to OEMs, although I would imagine it is up to the OEM to pass this on as part of their product. Despite today being the official launch of Carrizo, AMD has been tight lipped on exactly what SKUs will be in the market, how the segregation of products plays out, or even when OEMs are expected to bring them to market. At this point, Carrizo is more or less a paper launch showing off capabilities but nothing concrete we can yet play with in our hands. That being said, this week is Computex and I imagine some OEMs will be showing off some models (either on the show floor or behind closed doors). 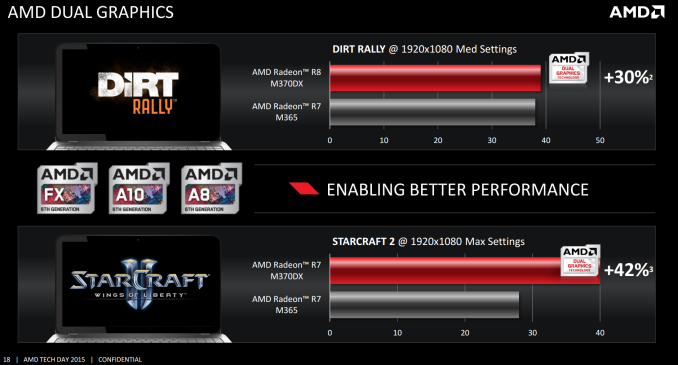 AMD’s biggest problem is still what I mentioned at the start – visibility. 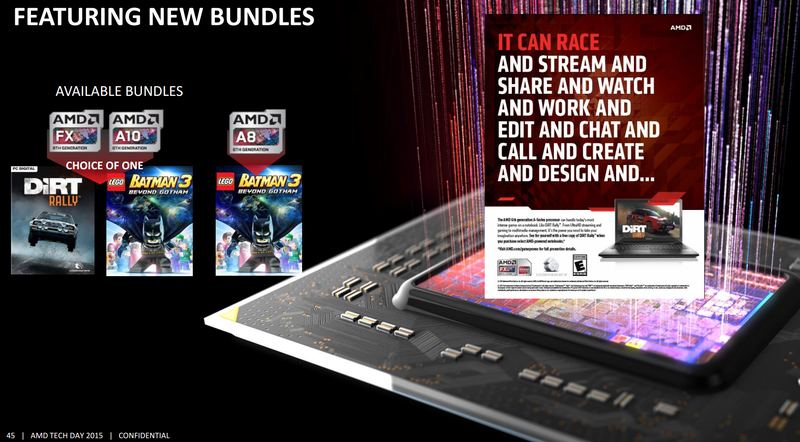 There are forums where users discuss where to find laptops with particular versions of AMD’s APUs, or what might be available in what markets. When you’re in a situation where users are struggling to find stock of your product, having to ask others to ship overseas or having to pre-order with retailers and befriend someone who works for that business, then something is up. Personally, I believe it comes down to the OEM perception of AMD in the laptop space. They are still seen as the budget play, prone to temperature issues and unresponsive for all but basic tasks. Sometimes it can be hard to break that perception, even with an aggressive marketing campaign or even providing samples to OEMs to test themselves – the competition is a known source. AMD needs a stable supply of good products in order to inject some knowledge into the ecosystem, and nothing comes better than a design win, but there is no obvious pursuant at this point. Reviewers have the same issues when it comes to sampling. OEMs and companies want us to test their high end halos, to experience a trickle-down effect, rather than a mid-range product. A bad review of a high-end product could cost some sales, but a bad review of something with more volume could mean a revenue reduction noticeable on the balance sheets. This is something we are hoping to change around, particularly if AMD’s claims about Carrizo hold water. As part of AMD’s Carrizo launch, several select media were invited to a specialist Technology Day a couple of weeks beforehand for an architecture deep-dive with Joe Macri, CVP Product CTO and Sam Neffziger, an AMD Corporate Fellow, about Carrizo. I want to cover what they explained with a few thoughts on the next few pages. 1. Beast-mode, high-performance desktop for gaming, video editing, etc. 2. 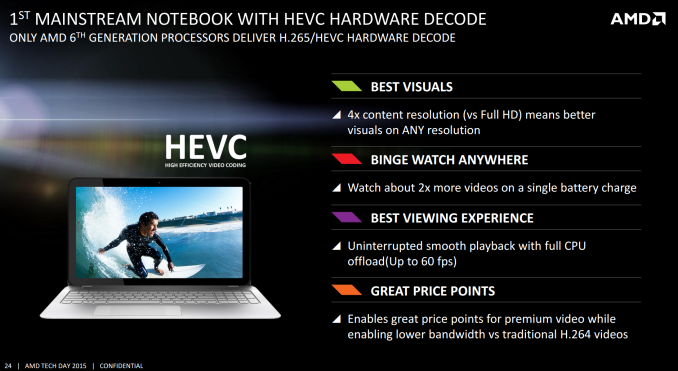 Low-power, cheap notebook/tablet for In-Home Steam Streaming and light gaming (720p) on the go. Yeah, that's my thing as well. High resolutions at work, and at home, 768p or 900p's just fine, especially for gaming. Like I said, to each his own. I have a Lenovo Z50 which I paid less than $470 with the A10 7300. Quite frankly, I could not be happier and I think it provides a massive value for that money. Sure, a larger battery and a better screen would not hurt, but for hustling it around the house, or bring it to friend/family house, watch movies, play games at native resolution, it is fantastic.